I know I’m not the only one to prefer savoury over sweet. Now, don’t get me wrong, I love me a box of chocs, but it will always be a cheeseboard which can tempt me most during a snacky night in. And this year, Santa has really brought the goods; bringing a deliciously cheesy advent calendar down the chimney of your local supermarket. I am so on (cheese) board. This 24-day advent calendar contains a slab of individually wrapped cheese behind each window, and – brilliant for those who like variety – there are plenty of different types to try. 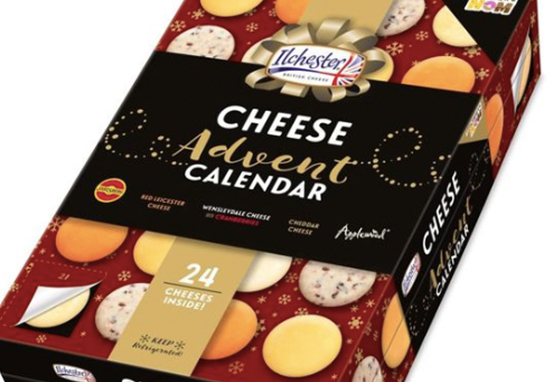 Within the delectable calendar is seven types of vegetarian friendly Ilchester cheese; including nutty Jarlsberg®, smooth Applewood®,tangy Ilchester® Mature Cheddar, classic Ilchester® Red Leicester, creamy Ilchester® Wensleydale with cranberries and Ilchester® Edam. There is also the Limited Edition Ilchester® Wensleydale with Gingerbread, said to have ‘delicious sweet flavour of Gingerbread biscuits’. The calendar costs between £8 – £10 – depending on retailer – and will be sold in Sainbury’s, ASDA and Booths nationwide from November 12 onwards. With an ingenious book like design, you can tear away the front part after the first 12 days, to make sure there is plenty of room left in your fridge for Christmas Day goodies. The Ilchester was sold in Asda last year, after a prototype was created by London based food blogger Annem Hobson, who won The Grocer’s Best New Product award for her brie-liant thinking. Thousands of people have supported my #CheeseNotChoc campaign, and with every single cheesy invention I make, I want to bring the fans along the journey. Without them, none of this would be possible. That’s why this year, not only have we added more variety of cheeses to the Cheese Advent Calendar, but I’m also sharing an exclusive prototype for a new product idea: The Cheese Cracker! If enough people want it, I will be working hard to see if I can bring it life! The initial concepts for The Cheese Cracker prototype include two sticks of cheese, oatcakes/crackers, a little jar of chutney, a hat and a cheese-themed joke. Yes to all of this. Those who tried out this calendar last year simply cannot wait for round two. 100% having this Ilchester cheese advent calendar next year again. Little bites of pure heaven daily! I NEED an Ilchester Cheese Company advent calendar and if not my Christmas will be irrelevant so someone pls tell me how to get one thx. I mean, I will try and stick to one window per day throughout December but I know I’m kidding myself….